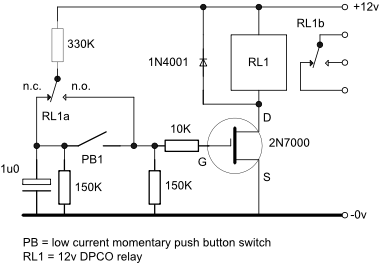 This circuit provides a latch facility with high current control for a low current momentary switch. The circuit powers up on the off condition. Pushing the switch causes the relay to energise and pushing it again de-energises the relay. Supply decoupling has been omitted for simplicity. The 1u0 polarised capacitor should be a low leakage electrolytic or tantalum type.